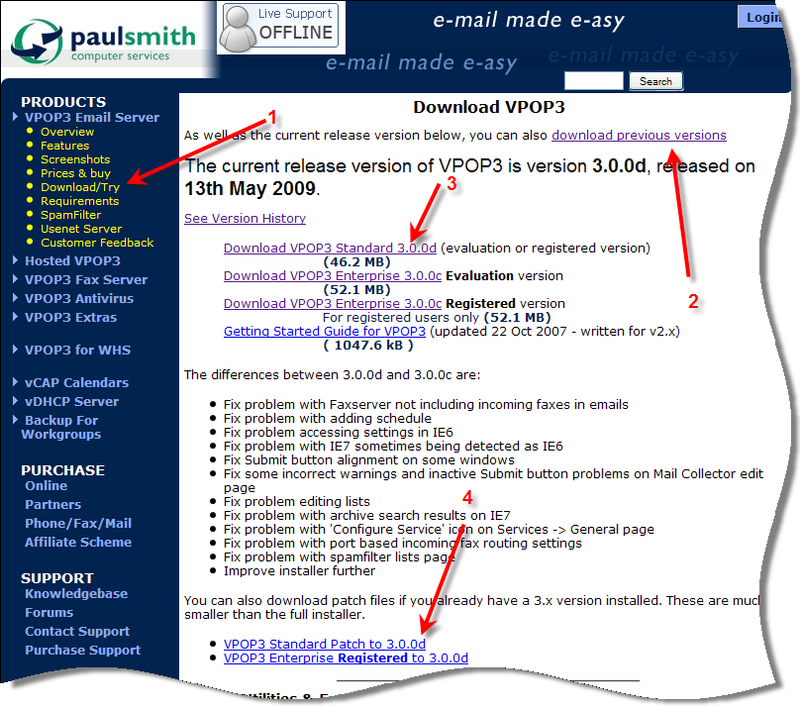 If you are wanting to download the current version of VPOP3, click on the appropriate link (3). If you are wanting to try VPOP3 Standard, click on the Download VPOP3 Standard link. If you have purchased VPOP3 Standard and want to download it to install again, click on the Download VPOP3 Standard link. If you are wanting to try VPOP3 Enterprise, click on the Download VPOP3 Enterprise Evaluation link. Note that if you have previously tried VPOP3 Enterprise and have now purchased a licence, you need to re-download it using the 'Registered' link. This can be installed over your existing installation, you will not lose messages, or settings. If you have already installed version 3.0.0, you may be able to download a patch file, which will be much smaller than the full installation file. To do this, click on the appropriate Patch download link (4) depending on your type of VPOP3 installation.